Supermassive black holes are lurking in the centre of almost every galaxy in the Universe, even our own. Despite remaining relatively unnoticed in the majority of the galaxies, a fraction of such black holes can become extremely bright, a consequence of their devouring substantial amounts of gas. These galaxies are known as Active Galactic Nuclei (AGN), and the most luminous members of this family, the so-called quasars, completely outshine normal galaxies like our Milky Way. Being so bright, quasars illuminate the gas in the cosmic web, revealing its structure and physical properties. Only about 5-10% of the total galaxy population manifest itself as bright quasars, so the case of two quasars at close projected separations in the sky and at similar distances is an extremely rare situation. Durham astronomers have conducted a survey to observe 54 closely projected quasar pairs at similar cosmological distances with the Wide Field Camera 3 on-board the Hubble Space Telescope (HST). These quasar pairs act as double flashlights, piercing the tenuous environment in two sightlines, thus providing a 2-D map of both the large and small-scale structure of the cosmic web. By measuring the path of ionising photons and constructing a composite ultraviolet spectrum pf pairs (see figure ), Durham astronomers found that the composite of these closely-projected quasar pairs show a different shape in the extreme ultraviolet compared to the one of single quasars. This is indicative of an excess of gas absorbing Lyman continuum photons, also seen when calculating the mean free path (i.e. how far the photons travel in the Universe before being absorbed) of ionising photons as a function of redshift. This gas excess could arise within large-scale structures or partially neutral regions inside the dark matter haloes where these close pairs reside. This figure shows examples of closely-projected quasar pairs (blue dots, one of the two pairs is pointed by the cross) in these images from the Sloan Digital Sky Survey. Only a small fraction of galaxies show themselves as bright quasars, so finding two closely-projected quasars at similar redshifts is extremely rare. 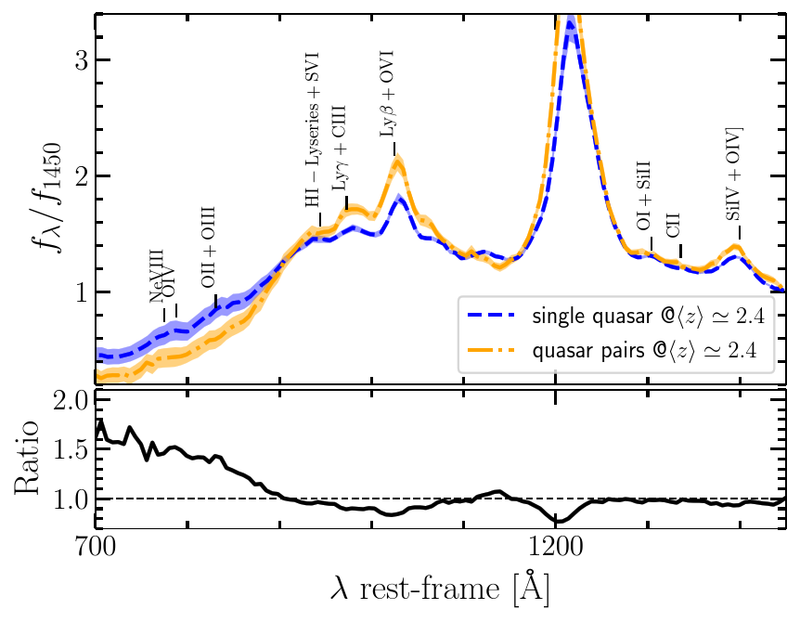 The left panel shows a comparison of the composite spectra for a sample of single quasars (blue) and the quasar pairs (orange) from this new HST survey. The flux decrement at 700-800 angstrom in the composite spectrum of the pairs is indicative of an excess of gas absorbing Lyman continuum photons. The same trend is also seen in the right panel of the figure, presenting the mean free path of ionising photons as a function of redshift. At the redshift of ~2.4, quasar pairs (orange point) have smaller mean free paths with respect to single quasars (red squares), which is indicative again of gas excess in the vicinity of the quasar pairs (i.e. 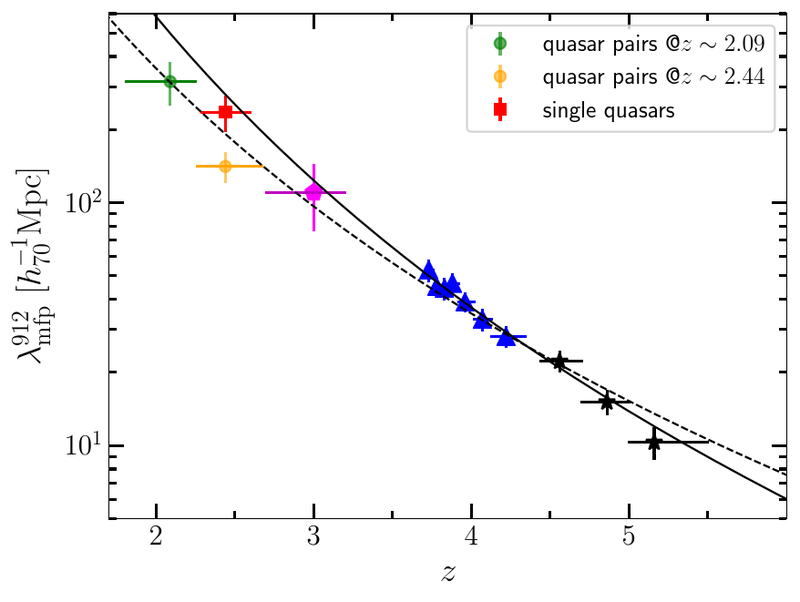 the smaller the value of the mean free path, the higher is the density in the quasar environment).